I am all about the tech. All about the numbers. I like to look at them, compare them, but I also understand there is more to everything than the pure numbers. Even Ferrari can't figure out the numbers on the GT-R, as evidenced by the recent Motor Trend Magazine Best Handling Car 2011 article. Like the one about Ferrari's zillion-dollar supercomputer simulator. Essentially, you dump a given car's vital stats into the system, and the simulator tells you how fast that car can go around a given track. "Knowing what we know, we can't figure out how the GT-R goes around the Nurburgring so fast." Randy Pobst's reply was that the car gives you confidence. 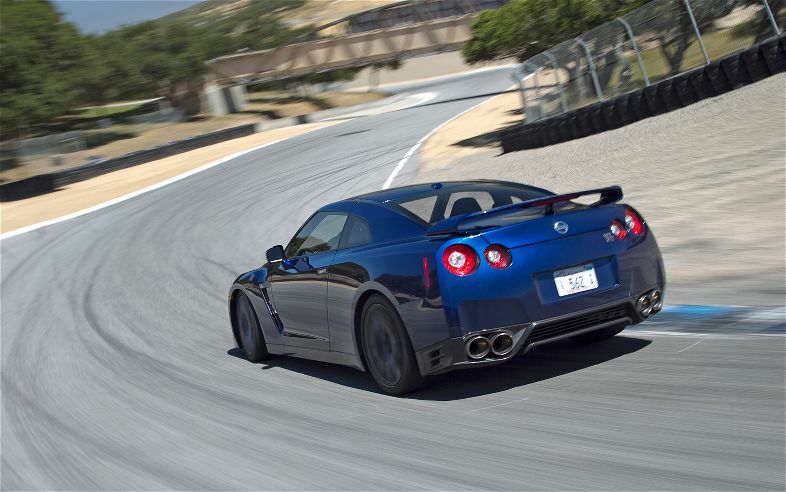 Or, the Nissan GT-R is easy to drive fast. Its not like some of the other rear wheel drive cars, that some people call "exciting". They are "exciting" because they are trying to kill you. The fastest cars, the fastest drivers look smooth. From corner to corner, nothing is exciting, nothing odd is happening, the car is just going fast. Justin Bell another pro driver had this to say about the 2012 Nissan GT-R.
As for Justin, Laguna Seca was his first time driving our former Car of the Year winner. The majority of his reaction involved him standing and staring at me. "I'd heard the car was good, but this thing is bloody incredible!" In first place in the test was the $287,654 Ferrari 458. The 458 is a great revolution on what the Ferrari 430 was. Motor Trend heaps tons of praise on the car, calling it one of the best cars ever. With the exception of the Corvette and its race-compound tires, the 458 was the fastest car around Laguna Seca. It was the second-quickest to 60 mph (3.2 seconds), and the second-fastest through the quarter mile at 11.3 seconds, just a tenth behind the GT-R and its AWD drag-racing advantage. More telling, the 458's trap speed of 125.6 mph was nearly 5 mph faster than the Nissan's. If you look at the chassis' slip angle, the difference between average and maximum is identical to the GT-R's at 1.2 degrees. The understeer angle between the two cars is virtually identical (52.3 for the Ferrari, 53.0 for the Nissan). Point being, a tenth here and a tick there, sure, but the two cars perform in virtually the same manner. 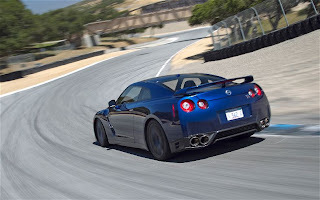 So finishing 2nd to what the journalists at Motor Trend call the best car ever, isn't bad for the 2012 Nissan GT-R. Head over to Motor Trend for the full results, videos, feedback from the drivers, and story.